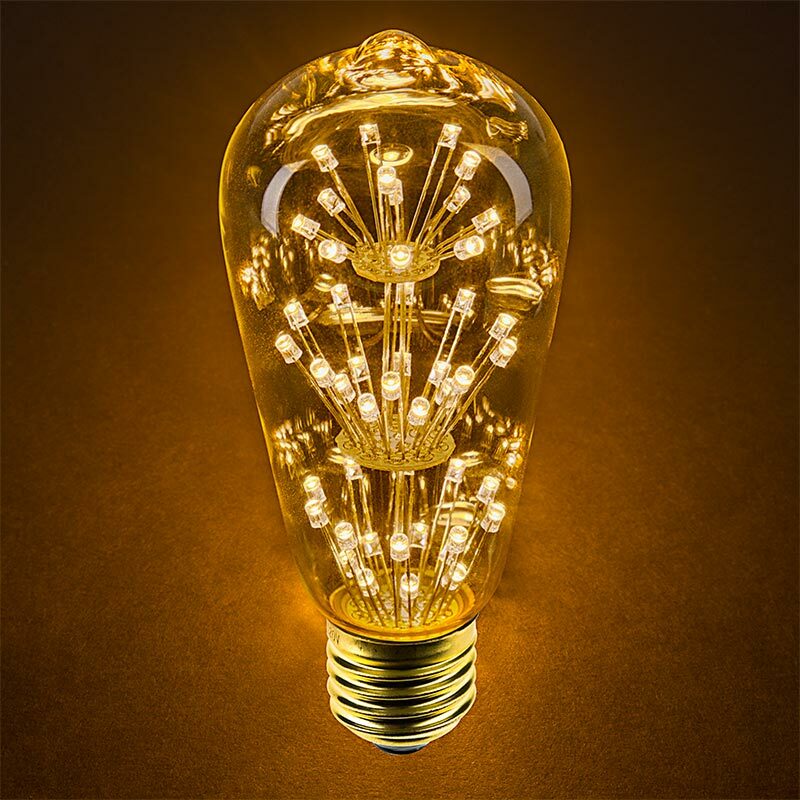 LED Fireworks Bulb - ST18 Vintage Fireworks LED Bulb - Dimmable: Shown On In Warm White. 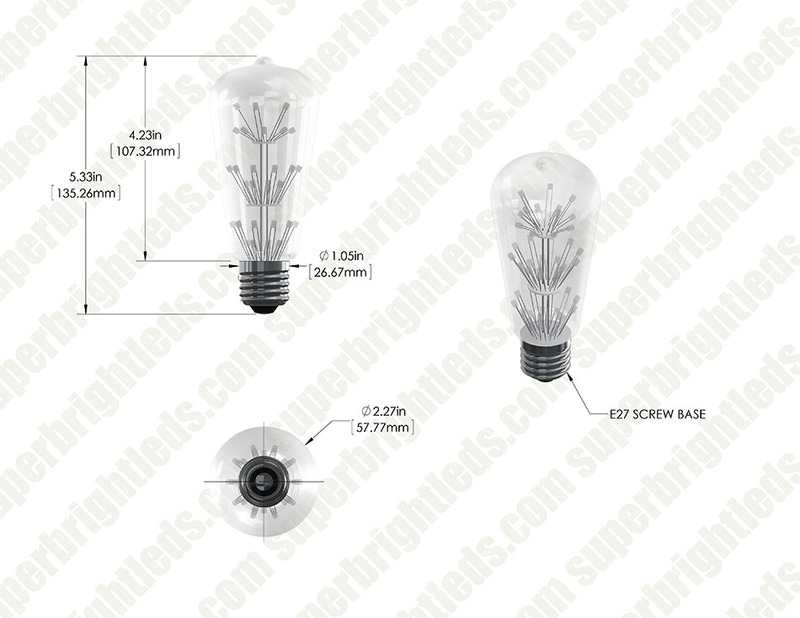 LED Fireworks Bulb - ST18 Vintage Fireworks LED Bulb - Dimmable: Shown On Light String. 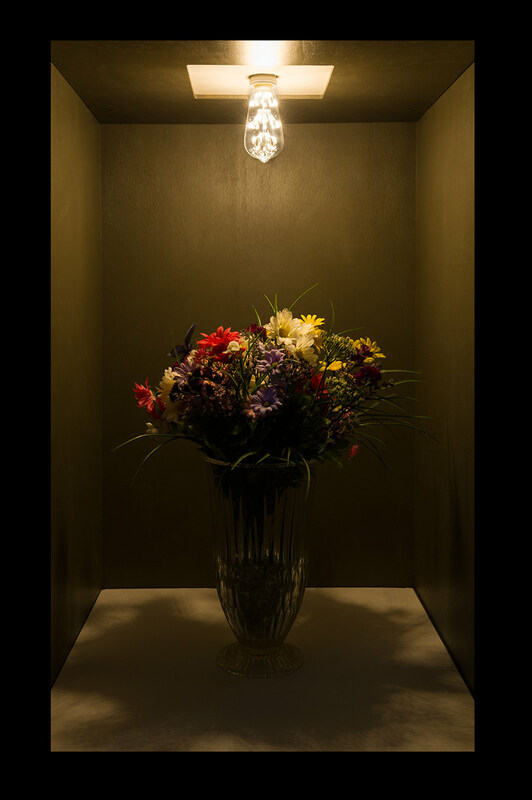 This LED fireworks bulb adds an elegant touch of warmth to any room while incorporating modern energy-saving technology. 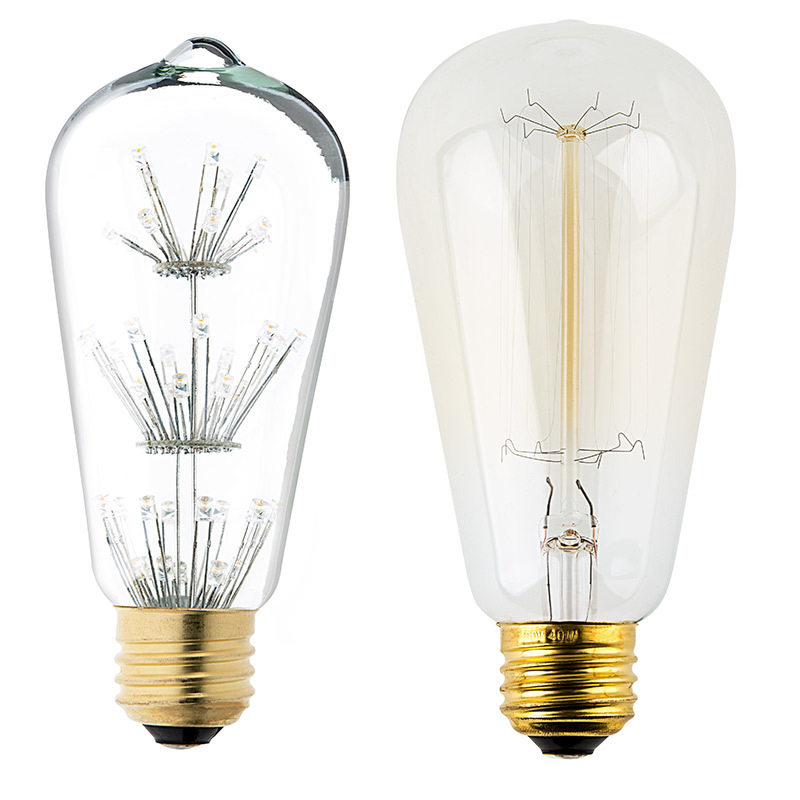 Given its decorative appeal, the ST18 LED teardrop bulb is an ideal fit for chandeliers, restaurant pendant lights, bistro lights, tent lighting, ornamental lights, commercial light strings, decorative light strands, outdoor wedding lights, or for any decorative application that accepts ST18 bulb types with E26/E27 bases. 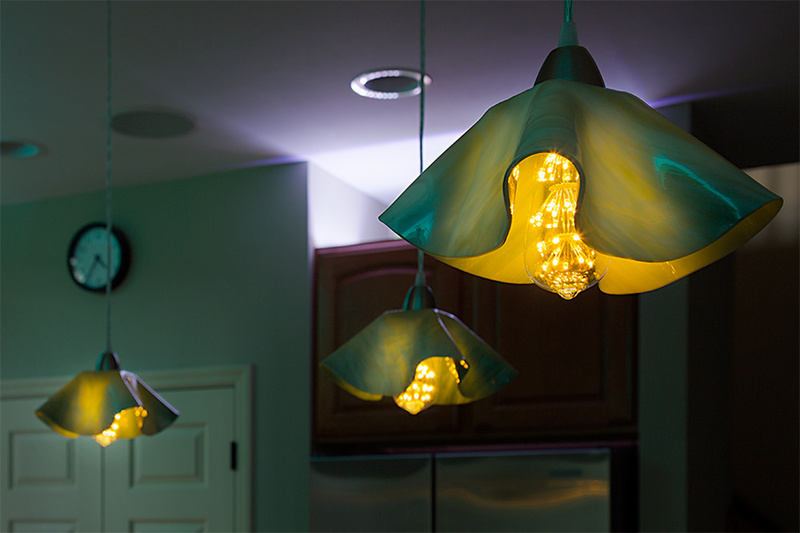 The captivating bulb uses 3 stacked groups of fanned-out LEDs —47 total— to mimic the look of exploding fireworks. 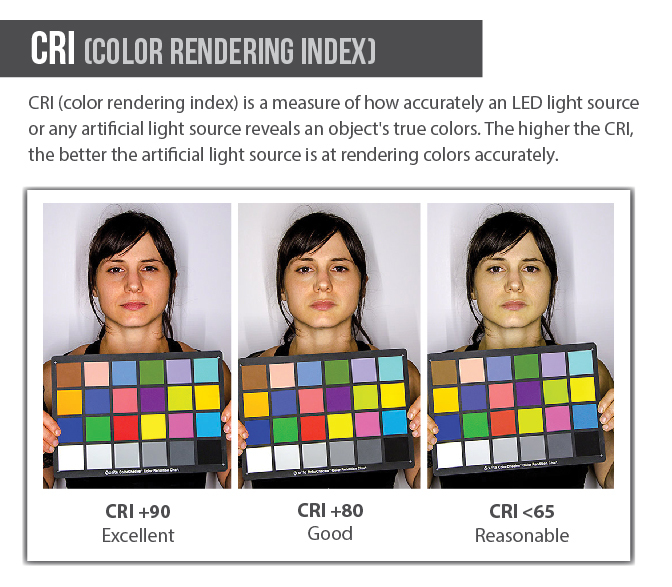 The warm white LEDs emit 120 lumens at 2200K color temperature in a wide 360° beam angle for allover illumination. The energy-efficient bulb uses only 2 watts of power; an incandescent bulb with comparable light output would consume 10-15 watts. 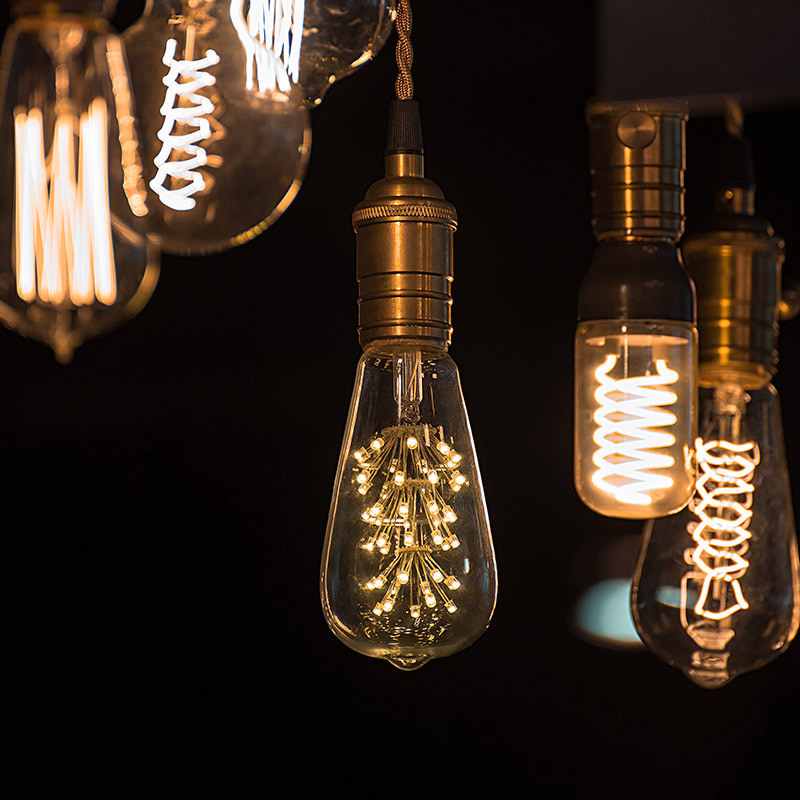 This bulb has 120 VAC operation and is designed to last 30000 hours—25 times longer than incandescent bulbs. I got two of these for a pair of clear, mirrored sconces in my bedroom. 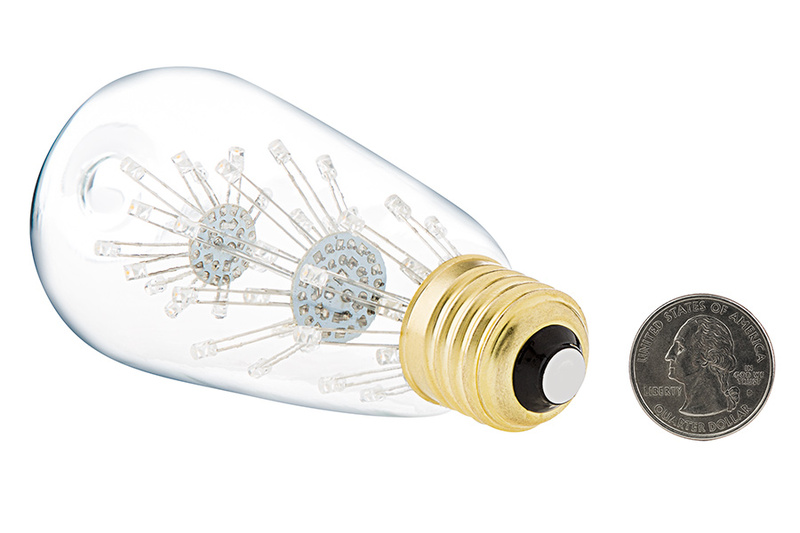 Since the sconces have glass sides, I wanted a bulb that was more interesting and fun to look at than a regular 65w lightbulb. These definitely give a nice aesthetic look. They are, however, much more dim than a 65w lightbulb (they are only 15w equivalent). If you have a dimmable 43-65 watt lightbulb in your house, turn it a quarter to half way down and that's the amount of light this puts out. I would describe it as "mood lighting" or "ambience lighting". I have two of them in my 120 square foot bedroom (one on each side of the room) and they are fine, but one light will not light up the whole room. The first photo is of one light on. I apologize for the color, I don't know why the light is green. It's actually more of a warm white light. The second picture is of my hallway before entering the bedroom so you can see the difference between a 65w bulb and these bulbs. The third picture is of both lights on. 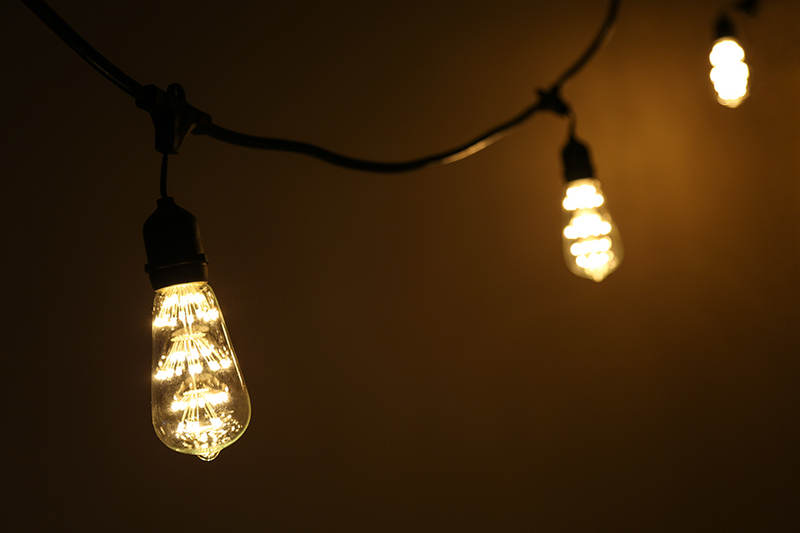 We have a retro-modern light fixture that came with 18 filament style bulbs. It looked super amazing, but the bulbs put off a lot of heat and it was really bright. We installed a dimmer switch to control the light output, but not many dimmer switches are rated for that much power draw and it would get hot. So, when we came across these, we thought they would be a great replacement. They do in fact look really cool (you can tell they are LED if you get up close). The two reasons they don't earn 5 stars are 1) They are not very bright at all. Even all the way up and with 18 of them on, they don't put out all that much light. 2) They are not really dimmable. They basically have 2 settings (full on & partially, maybe less than half, on). Different wall dimmers have different characteristics. 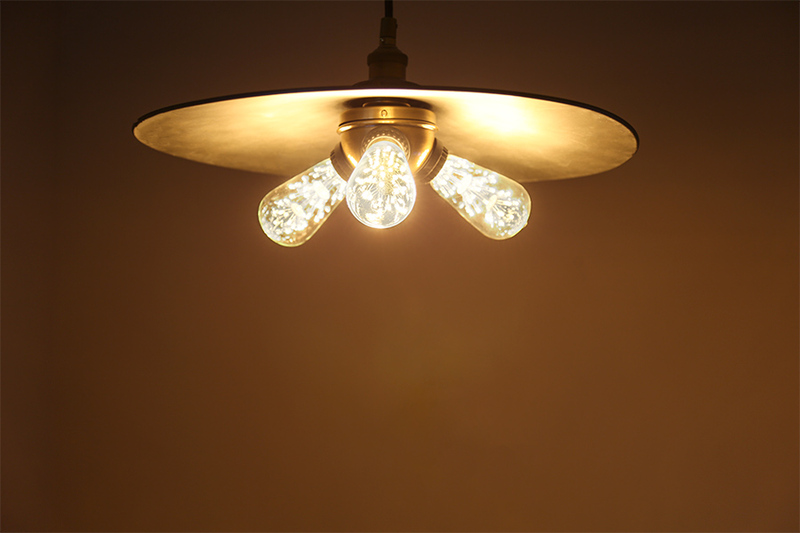 A different model of dimmer may provide full range of dimming to this bulb. I have an older dimmer system and this bulb did not work with it. I like it's overall look however and will keep it to find another use.